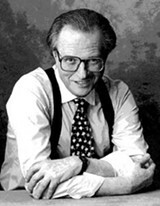 Mugging: Talk host Larry King sings praises to Woody Allen's newest. Writer David Templeton takes interesting people to interesting movies in his ongoing quest for the ultimate post-film conversation. This time out, he fields a phone call from radio-TV interviewer Larry King, discussing their synchronized bicoastal viewings of Woody Allen's new film, Everyone Says I Love You. YOU SAW THE MOVIE, right?" rumbles the distinctive voice of Larry King, beginning our little chat the same way he begins his nightly CNN television show: with a nice, simple question, direct and to the point. Yes, I reply, I saw Woody Allen's Everyone Says I Love You last night at a press screening in San Francisco, knowing that he saw it last night, too, at its world premiere in New York City. Throughout our 25-minute long-distance rendezvous, King asks many questions, shifting easily from the role of interviewer to interviewee. Asking questions, he has said in the past, is his lifelong hobby. Others have added that he also displays a marked enthusiasm for the dropping of names. Both skills are in evidence today. "I had a great talk with Woody last night," he offers, after describing the premiere. "We talked about Brooklyn. We went to competing high schools, you know. He played baseball for Midwood and I was at Lafayette. I graduated in '51. He graduated in '53. He was a pretty good ball player. He even thought he might have been a pro player." As for the movie itself, King--no stranger to love's inequities--is unsparing in his praise. "It's a lovely, funny, beautifully done movie," he says. "I can't think of anything I didn't like about it. Last night was my second time seeing it; I saw it a month ago when it was released for a one-week run to qualify it for the Oscars. And now I could see it a third time." He pauses. "Couldn't you?" Easily. As its title suggests, Everyone Says I Love You is about the universality of Love with a capital "L." It is an unapologetically giddy homage to the fine art of going gaga, a very charming comedy in which all the characters frequently burst into song, singing and dancing to classics such as "Making Whoopie" and the standard "I'm Thru with Love," all to illustrate the potent notion that people in love do inexplicable things, like singing, in spite of the fact that the people involved (Goldie Hawn, Drew Barrymore, Alan Alda, Edward Norton, Tim Roth, Julia Roberts, and Allen himself) are not exactly trained singers. The result is as endearingly goofy as it is dazzling. "I've been singing 'I'm Thru with Love' for a month now," the oft-married King laughs. "I sing it at odd hours. I sang it as a duet last night with Drew Barrymore." I ask if he can really sing, to which he replies, "Sure, I can keep a tune. In my heart I've always wanted to be Vic Damone. "This movie is a spoof of movie musicals, but it's a tribute to them at the same time," he continues. "It is about the craziness of love. In love. Out of love. Manic in love. Julia Roberts is nuts in love. There's the young daughter who falls in love with everyone she meets, Goldie Hawn who loved Woody but now she loves Alan Alda but still sort of loves Woody. The young man who loves the girl who falls in love with the criminal, with the criminal kind of liking her but then using her, so she goes back to the first guy. Woody Allen knows human nature." I pose a theory that without the crazier aspects of being in love, love itself would be less enjoyable. "How old are you?" he asks, suddenly curious. "How many times have you been in love?" Um. I'm 36 and I've been in love at least half a dozen times, I reply. "Well, I'm 63," he reports, "and I can say that, as I define 'in love,' I've been 'in love' three times. This is with women who, by a whim, could drive me nuts. The slightest change in expressions on their faces could make me depressed. These are women who, when they say they'll call you at 4--if it's 4:15, you panic. "Love can make you do crazy things," he goes on. Alluding to Allen's musical, King says, "I've danced on the street for women I've loved. I've sung love songs. I've whistled. I've skipped. I've gotten angry and thrown suitcases across the room. I've done everything like that. I've had furs delivered. I got a car once for a woman with a ribbon wrapped around it. "I'm a romantic guy! I like flowers. I like surprises. I like the chase. And I like being in love. But I don't like the pain of it. With love comes pain." This, King insists, is why he's currently not in love, and why he's happy to remain so. "I am 'in like' with someone, though," he adds playfully. "I gotta tell you, I have a better life when I'm just 'in like.' Sure, I'm never as, you know, 'off-the-roof' as I am when I'm head over heels in love. "Then again," he adds, laughing happily at the thought, "I'm never as depressed, either."